When archaeologists unearthed a large chamber tomb in San José de Moro, a ceremonial center of pre-Columbian Moche civilization on the northern coast of Peru, they found the remains of a woman who had been laid to rest with lavish offerings, befitting a priestess or a queen or both. Excavated in 2013, the burial featured a richly decorated coffin covered with copper plaques, and inside it a skeleton, buried 1,200 years ago, along with precious pottery vessels, a ceremonial knife, and a silver goblet, all telling signs of the power the woman had wielded in life. The discovery of the splendid burial shattered archaeologists' notions about the Moche, which until recently had been perceived as a society ruled by male warriors, said Peruvian archaeologist Luis Castillo, the 2016 Robert F. Kennedy Visiting Professor in Latin American Studies Lecture. 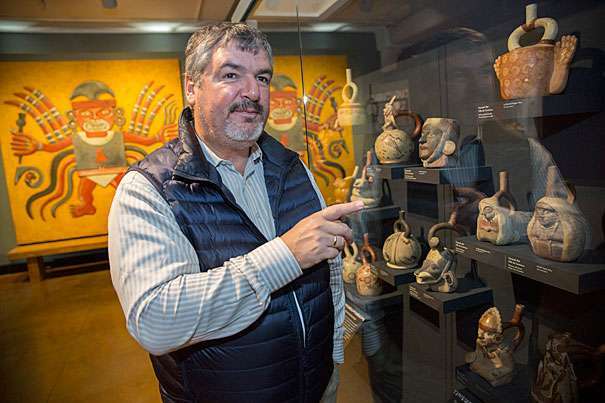 "When I started as a young student, 25, 30 years ago, we thought the Moche was a culture led by powerful kings, warriors, or priests," Castillo said at the Harvard Peabody Museum, where he taught a course on the rise and the fall of the Moche. The royal tomb, the eighth found in 25 years, was discovered by the San José de Moro Archaeological Program, which is shepherded by Pontifical Catholic University of Peru and headed by Castillo. All eight tombs showcased women wearing rich headdresses and beaded necklaces, and surrounded by sacrifice victims and exquisite relics including silver goblets. Called the priestesses of San José de Moro, they highlight the prominent role of women in Moche society. "These women were among the most important individuals in their society," said Castillo. "Their elaborate burials are narratives of their lives, and the ornaments they were buried with are indicators of their high status." Archaeologists believe that the women were priestesses because of their resemblance to figures depicted in rituals scenes found on Moche art. The Moche had no written language but left thousands of ceramic vessels with intricate drawings portraying their daily lives and their cosmological beliefs. In those depicting human sacrifice, a priestess wears a headdress and holds a silver goblet filled with victims' blood. Regarded as the first state-level civilization in the Americas, the Moche flourished and ruled the northern coast of Peru before the Incas, between the first and eighth centuries, at the same time the Mayas thrived in Mexico and Central America. They dominated the desert through a complex irrigation system, built adobe pyramids, and, like many ancient cultures, used religion to unify society. 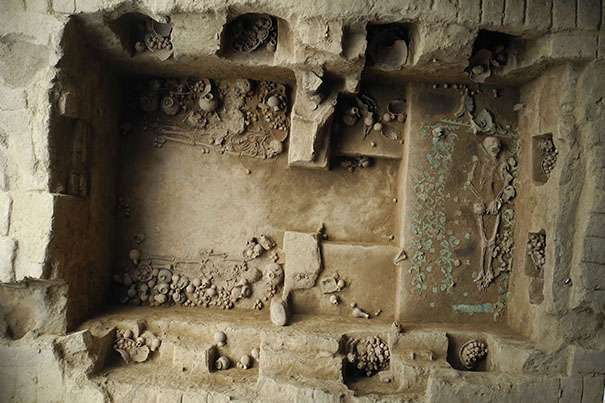 The finding of the priestesses of San José de Moro has taken place amid a backdrop of other excavations that have made the Moche an electrifying subject of archaeological research. In 1987, Peruvian archaeologists found the regal tomb of the Señor de Sipan, which has been compared to King Tutankhamen's tomb in Egypt. And in 2006, they discovered a well-preserved mummy buried with magnificent objects and two ceremonial war clubs in Cao, a town on the northern coast of Peru. A warrior queen, the Señora de Cao, is considered the first female ruler of pre-Hispanic Peru and is believed to have reigned 1,700 years ago. In the wake of the recent discoveries, archaeologists are also dropping a widely held belief that the Moche in northern Peru were a unified empire led by a single ruler. "They were multiple polities, small chiefdoms that never achieved a political unification," said Castillo, Peru's former vice minister of culture. "Some communities may have been led by women and others by men." Studies of the remains of Moche priestesses show they were physically strong and well-fed, another clue to their status and nobility, which may have influenced their positions of power in society. Many pieces of Moche art are on display in museums around the world, including a permanent exhibit of Moche ceramics at the Peabody Museum, but with the growing interest in that culture, the mystery around the Moche elite women persists. "They were not the sisters, the mothers, or the wives of somebody powerful," Castillo said. "In all the burials, the women had a status associated with Moche priests. They were priestesses, but they could have also been rulers. In ancient cultures, political and religious power were blended, and the rulers were often the priests."